Goodness! There’s just one more day until our first WCMW concert of the season and we are beside ourselves with excitement! I thought it might be fun to give you a little behind-the-scenes glimpse of our preparations for tomorrow’s event and our 2012 season. Hope you enjoy! Wednesday night: Steve and I did our final round of edits on the program book and did a once-over proofing to make sure everything was set to go for our first round of printing Thursday morning. After several hours of tweaking, converting, saving, and sharing between computers (madness, at times), we finally ended up with a final copy of the file… at 12:45 a.m. Phew! First thing Thursday morning, Steve was at Staple’s to pick up some extra paper and I was on my way out the door to get started on the copying. This year’s program book is a grand 36 pages (9 sheets, front and back)! Things never go exactly as planned, of course. After many frustrating encounters with a botched file (and a trip home to fix it), paper jams, chewed up glossy (expensive!) paper, and roller marks, we finally got everything sorted out. We spent a total of 3.5 hours sending one page at a time to the copier (Steve’s job) and feeding a few pages at a time (one side at a time) into the copier (my job) but we have 100 beautiful program books to show for it! I count that as a success! Today's job is collating and stapling. So looking forward to handing these out on Saturday night at our jazz event! About the WCMW: Based in the beautiful north-central region of Massachusetts, this summer chamber music series offers an assortment of dynamic concerts and special events presented by renowned guest artists from the regional area. Founded in 2011, the Westminster Chamber Music Workshop exists to provide opportunities for community members of all ages to come together and experience great music. With the support of generous grants, sponsors, and donors, all of our events are free and open to the public. WCMW. Four concerts, ten guest artists, four weeks. Steve and I are so excited about this year's series of events - everything kicks off this Saturday night! Of course, being that it's Thursday, we're still madly working through our to-do list. 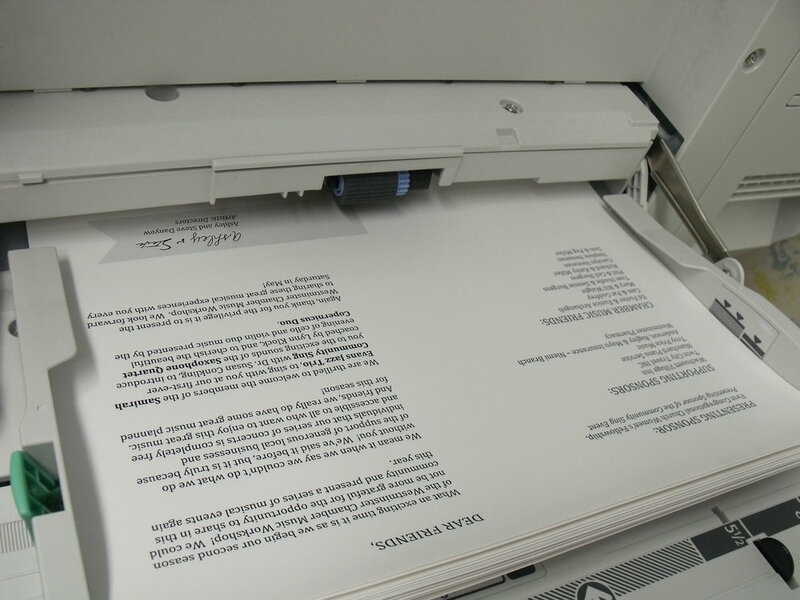 Program books are being printed this morning, concert reception food will be prepped Saturday morning, and we'll welcome our first guest artists (coming down from Brattleboro) Saturday afternoon! Join us for an evening of sultry, fiery jazz tunes if you're in the neighborhood and stay tuned for updates on the blog throughout the month! Finals. This has been one long semester. I may be more excited about finals than my students! For my lecture class (28 students), the final is a 10-page paper (I know, what was I thinking?). For my class piano students (13 between two sections), the final is a jury demonstrating major scales, solo repertoire, accompanying repertoire, harmonization, transposition, and improvisation. As of today, there are just two more teaching days and juries left to go! Come on, summer! Concert/Recital Preparation. This weekend, I'm organizing a student recital for the community music lesson program at Fitchburg State University. That will mark the end of the term for the six private students I've had this spring. Next month, Steve and I are planning a joint recital for our teaching studios in Westminster which means our lessons this month are focused on choosing repertoire, polishing, and preparing for performance. The Sanctuary Choir (my adult choir at church, pictured above) will be presenting a Sunday afternoon program of music early next month. Last month, I chose the repertoire and we spent part of one rehearsal voting for our favorites. Now that I have a program of anthems and a narrator on deck, I need to put everything in order and write the narration! Balance and adventure. The last few months have been crazy. In January, I had to let go of planning way ahead and embrace the "sink or float" mentality, taking things one week (and in some cases, one day) at a time. That recital in two weeks? I can't think about that until I've gotten through the recital this week. That webinar we're doing next month? I can't work on that PowerPoint until I'm done with my slides for class next week. As hard as this has been for me to get used to it's reconfirmed to me the necessity of balancing my priorities. The big things on my calendar this spring were all priorities... just not all at the same time. Additionally, while these things are important, there is something to be said for living a life of adventure. Things change. Be open. Sometimes, spending the evening talking with SD is more important than finishing that blog post for tomorrow. Sometimes, Sunday afternoon naps are more important than catching up on emails. Sometimes, taking time for a walk is more important than grading papers. Those other things will get done. In that moment, choose what matters. Choose the people you love. Choose the things that fire you up. Choose the things that inspire you. As things wind down this month and next, I want to continue to challenge myself to live a life of balance and adventure. - Finalize program book. Proof. - Revise media release for guest artists. Make copies. - Charge flip video recorder. - Replace batteries in camera. - Send email blast. - Get piano tuned. - Make grocery list for reception items. - Print program books. Assemble. - Update foam board poster. - Make food/beverage for reception. As some of you might recall, Steve and I co-founded and co-directed the first Westminster Chamber Music Workshop last summer (recaps here and here). A week-long series of music events for the community alongside a chamber choir workshop for adult amateurs, we wrote a few grants, built a website, contacted the press, brought in guest artists from the regional area, advertised, and organized the details. What a wonderful privilege to be able to create new opportunities for music! These sorts of creative projects are some of my favorites as they combine my interests in leadership, community music, and teaching. Last week, we announced the dates for the 2012 WCMW (read the full post here). If you’re in the area, be sure to mark your calendars! I hope you’ll plan to join us for these four very exciting events if you’re nearby! Want to be in the know? Subscribe to our blog (see sidebar) and sign up for WCMW email updates! We're starting a chamber music workshop this summer! Keywords: FREE, concert series, local, great music, June 20-25, cookies and punch! We've been busy these past few months with grants, applications, marketing, blogging, and planning but the Westminster Chamber Music Workshop (WCMW) is just over a month away! It's been an exciting process so far. Steve and I received grants from the Westminster and Ashburnham Cultural Councils, as well as support from Fitchburg State University, Academic Affairs. We have an incredible group of friends coming to perform, coach, and share presentations during the course of the week. We have generous local venues. We have a great group of sponsors - local businesses and gracious individuals. We have LOTS of great music planned! For more details and the full schedule, visit www.westminsterchambermusic.org. And if you're in the neighborhood June 20-25, please JOIN US!